(SPOILERS) The first Huntsman movie, sorry, I mean Snow White movie featuring the Huntsman, was a reasonably watchable affair that did better business than most were expecting. Not Maleficent levels, but enough to warrant a sequel. 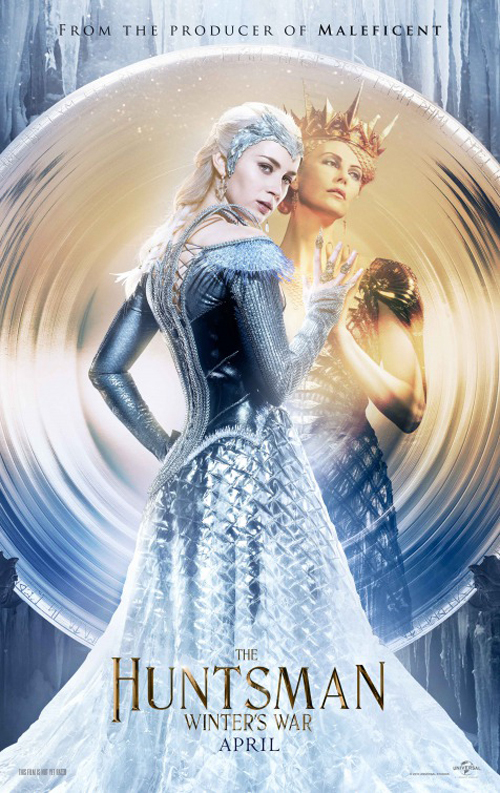 The arising question then becomes, why put a sequel into production when it’s as broken backed in conception as The Huntsman: Winter’s War, and is virtually guaranteed returns that render giving it the greenlight questionable? Well, I guess the answer is: you never do know. After all, that 300 prequel did surprisingly well, so even not having Kristen Stewart on board for Winter’s War didn’t necessarily spell doom for a would-be franchise… It’s a different matter if your plot is spinning around her absenteeism, however, smacking of covering for the lead in a TV show when they’re indisposed for a few weeks, but to the tune of about $100m more in price tag. Or like making a Pink Panther movie without Peter Sellers – no one would ever do such a foolish thing. Winter’s War’s make-do quality is further emphasised by the piecemeal presence of other characters (Sam Claflin cameoing as King William, dead-alive Charlize Theron back again) adding to the sense that it isn’t a fully-fledged movie in its own right, no matter how much writers Evan Spiliotopoulos and Craig Mazin attempt to fashion a distinct (sub-Frozen) plot about Ravenna’s sister Freya (Emily Blunt) and the Huntsmen she raised in a pit of lovelessness (yes, this is an origins story, because we all wanted to find out where Eric came from). Blunt is fine. Theron is fine. The movie is better when both are onscreen at the same time, so hopefully this won’t be the only time they share it. Hemsworth, saddling himself with what I think is supposed to be a Scottish accent, but I can’t be entirely sure, proves, where the likes of Sam Worthington and Daniel Craig have before him, that bankability and star status in one franchise is no indication that any old bog-standard hero role will be infused with their nominal charisma. He’s dull, basically, and completely fails to spark any chemistry with Jessica Chastain (as Eric’s estranged wife Sara). Which means the best thing here is, weirdly, big screen legend Rob Brydon, playing the returning Nick Frost’s dwarf cousin (could they not get any other dwarves back, or was it simply that Frost was the cheapest?) The dwarf make up is pretty basic – he looks more Klingon – but whether or not Brydon’s lines are improvised, he makes a fair fist of getting laughs from them, which may simply be down to his delivery. One aspect of the picture that could be deemed a success, depending on your measure of what constitutes a compliment, is that this does rather recall ‘80s fantasy flicks, the questing likes of Krull and Willow, only more watchable. Cedric Nicolas-Troyan, graduating from visual effects and second unit to full director status, can’t muster anything amazing (some of the effects, nay most of them, are pretty rank), and falls back on distractingly choppy editing at times, despite it being evident that he has almost grasped a rhythm for the fights. There’s nothing that could be called laudable on any level, or even vaguely noteworthy, but The Huntsman: Winter’s War passes the time, is largely inoffensive (unless you get offended by jokes about ugly female dwarves, one of whom is Sheridan Smith, so not that ugly), and as unnecessary sequels go, there are a lot worse out there, even among summer 2016’s offerings. More watchable than Krull?? That would make this one of the most watchable movies evar!